Our spontaneous beer series continues. The second article features Jester King Brewery! Jester King brewed its first batch of spontaneous beer on February 26, 2013 but the spontaneous program has roots dating back to 2010. when founder Jeff Stuffings was performing small volume spontaneous inoculation experiments on the rooftop of the brewery. The experiments were ultimately successful, resulting in wild yeast isolates for use in mixed culture beers. Stuffings drew inspiration from by traditional lambic producers such as Cantillon, 3 Fonteinen, Girardin, and Oud Beersel when creating the Jester King spontaneous beer program. Due to the hot Austin, Texas climate, Jester King limits spontaneous brewing to only the winter season (January-February, sometimes December) for traditional batches. Brewers target an overnight temperature between 30-45°F. The traditional grist is composed of 60% Pale Ale/Pilsner Malt and 40% Unmalted Hard Red Winter Wheat, whereas experimental grist often includes adjuncts such as oats, spelt, and rye. Jester King uses whole-leaf hops that have been aged onsite, in burlap bags in the attic of a horse barn, for several years. They also use raw well water for their spontaneous beers. A turbid mash is used for most of Jester King’s spontaneous beers. The mash schedule was adapted from Wild Brews and tailored to Jester King brewhouse specifications. The sparge is performed at 190°F. Jester King uses a straight-forward, extended four-hour boil. Hopping rate has evolved over time, from 1.25-2.0 lb/gal to 0.5-0.75 lb/gal to 1.0 lb/gal. Today, the brewery finds 0.67 lb/gal as a “sweet spot”, but varies hopping rates between 0.5-1.25 lb/gal throughout the season to have a variety of blending stock available. After the boil concludes, the wort is whirlpooled, rested, then transferred into the coolship. The coolship was fabricated in-house, using a stainless steel frame and copper overlay (for better heat transfer properties). It measures 16′ x 7′ x 1.5′ and holds 30 barrels of beer. The coolship also features a stainless steel hop basket and copper immersion chiller. The latter is reserved for experimental batches only, and has only been used approximately four times through 2017. To help establish the native microflora, oak paneling was installed around and above the coolship, which resides in the loft/mezzanine of the barrel room. Spontaneous inoculation is encouraged by open windows/doors and fans in the barrel room. The wort is remains in the coolship for 12 hours, overnight. Typically by 7AM the next morning, the wort has cooled to its target temperature of 70°F, though overnight wind and humidity can impact this usual timeline. The cooled wort is transferred into a stainless steel cylindro-conical tank and recirculated for one hour to achieve microflora homogenization. Jester King prefers neutral French or Hungarian oak puncheons (400-600 L) to ferment spontaneous beer. The large format barrels are used specifically for spontaneous beers to reduce overall oak character. The puncheons are vigorously rinsed then steamed for 5-10 minutes each to inhibit microbes in the wood. They are reused indefinitely, even if they have off-flavors, unless they exhibit acetic acid. Puncheons are filled with wort and left unbunged for the first two weeks, during primary fermentation. Jester King typically sees visible signs of fermentation after 2-4 days, but some batches have needed upwards of 1-2 months. Once bunged, brewers taste the spontaneous beer for the first time. Often, this initial sample is extremely bitter and astringent with a grain/corn flavor. After 1-2 months, the bitterness and astringency begin to fade, allowing brewers to screen for off-flavors, despite the beer still being “rough”. Common off-flavors include butyric acid (vomit), acetic acid (vinegar), isovaleric acid (stale cheese), wet dog (musty), or mud/swamp. Approximately one in four/five barrels requires dumping due to off-flavors. The barrel room is maintained at 60°F year-round to retard acetic acid production. Barrels are never topped off, despite spontaneous primary fermentation creating volume loss in the barrel. Brewers prefer local fruit for use in its spontaneous beers. When Texas fruit is unavailable, they import fresh or frozen fruit from other states. To highlight the great qualities of the fruit, it is used at a ratio of 3-5 lb/gal. Jester King has adopted a sensory approach to drive spontaneous beer blending. They utilize acidity as a way to achieve overall balance and to harness softness, brightness, and drinkability for the blend. 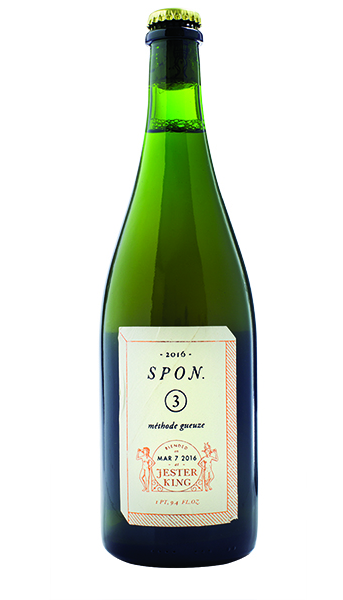 The spontaneous beers are hand-packaged in 375ml and 750ml champagne bottles, corked with natural Portuguese corks, and finished with a crown cap. Green bottles are preferred due to Stuffing’s love of slight light struck beer character. Some spontaneous beer is also packaged in large formats as well, including 1.5L magnums, stainless steel kegs, and one-way kegs. For achieving refermentation in the bottle, Jester King originally experimented with blending in young spontaneous beer (as is done with gueuze), but bottles did not carbonate in a reasonable amount of time. Ultimately, they settled on using 5.5g dextrose per 750ml bottle, added at packaging (no added yeast). Bottles are conditioned horizontally in metal cages at 70°F for several months then moved to 60°F. Jester King sees desirable carbonation in 4-6 weeks, however flavor integration requires many months. During bottle conditioning, acidity increases and bitterness softens.